cost-­effective defense against wind and water damage in the event of a hurricane or other severe weather situations. The Foam Seal Hurricane Protection System can be applied to both new and existing roofs, strengthening uplift resistance and creating a gapless, watertight seal. Is your home prepared for the upcoming hurricane season? Between 50 and 70% of hurricane induced losses are caused by roof failures. Until recently, effective mitigation options to strengthen and waterproof existing roof systems have been limited. The patented Foam Seal Hurricane Protection System is a cost effective method for reducing wind and water losses, while increasing peace of mind during a hurricane. Foam Seal SF2100, once applied quickly hardens into a watertight adhesive seal that strengthens the structural integrity of the roof. Foam Seal Hurricane Adhesive’s installation process can be applied to both new and existing roof structures. A certified Foam Seal applicator will spray the product to both sides of the roofs truss and sheathing connection, and along all seams to seal the gaps left open between the sheathing connections. Foam Seal will increase the uplift strength of the roof up to 5 times stronger then nails alone. Water intrusion will also be reduced by 99%, if the roof covering (shingles or tile) fail. Investigations following recent storms, such as Hurricane Andrew, Hugo, and Opal have shown that the primary source of damage resulted from failure of the roof sheathing. Even slight damage to the roof covering will allow water to start entering into the attic. 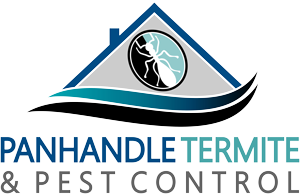 When the water enters the house, dangerous mold spores can start to grow. These mold spores can be very costly and time consuming to remove. This can create a situation where the home becomes uninhabitable until the removal process is complete. Until now there has not been a cost effective way for a homeowner to reinforce their roof. 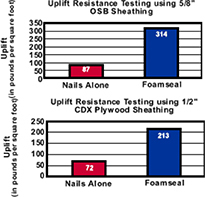 Foam Seal is priced similar to the cost of re-­nailing the roof, but the increase in uplift resistance is far greater. With Foam Seal you can retrofit your roof with a water proof foam that is stronger then the wood that it connects. Testing at Clemson University’s Civil Engineering Department shows that roof structures can be strengthened to increase uplift resistance from 2 to 4 times the strength of nails alone. Building Code required nailing patterns should develop sufficient uplift resistance for winds developed in lower category Hurricanes (Category I, II and III). However, if the building envelope is breached, internal pressures can double, thus exceeding sheathing uplift resistance causing a roof failure. History has taught us stronger hurricanes may develop sufficient uplift pressures to remove roof sheathing without window or door failure.